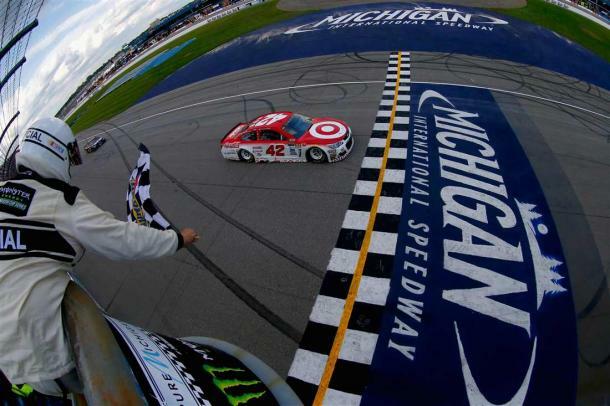 Kyle Larson snatched a dramatic overtime victory in the Pure Michigan 400 with a sensational restart to jump ahead of the two Furniture Row Toyotas of Martin Truex Jr and Erik Jones and lead the field past the checkered flag. It was the third straight win at the track for the driver of the Chip Ganassi #42 Target Chevrolet, and a one that looked unlikely with the two overtime laps being the only laps in the race that he led. Kyle Larson, who told NBC after the race that this win “feels better than any of my other Cup wins or Xfinity wins”, sits second in the points standings, and more crucially, has the second most play off points (18) behind the leader of both categories, Truex Jr.
On that final restart, Larson slid between the two Toyotas, taking them three wide, and ran right up next to Truex Jr to side draft him into the first corner. The move proved to be decisive, and he stretched away enough to start celebrating on the back stretch of the final lap. All the talk pre-race had been about the power battle between the Toyotas and the Fords, and in the early stages of the race, it looked as though that was exactly how it was panning out, with pole-sitter Brad Keselowski dominating the first segment in his Penske Miller Lite Ford which saw him take the stage win by over half a second from Kevin Harvick. The second segment reverted to what has been the norm recently with Truex Jr winning it at a canter by over a second from Harvick who finished the stage as runner-up again. There were no Chevrolets in the top six at the end of that stage, and Larson had struggled to make his way up to eighth but had shown none of his dominance in previous Michigan races. The race had few cautions with the only yellows during the first two segments being the stage-ending ones. The first unscheduled yellow was a huge incident between Kasey Kahne and Daniel Suarez – the latter caught mid-pack due to contrary pit strategy that would have put him in with a chance of a top five, or even a win, in the later stages Kahne drove underneath Saurez in turn two, but seemingly misjudged his pass and – believing he had cleared the #19 Arris Toyota – clipped his front wing, lifting the back end of his #5 Chevy in the air, and putting the talented Rookie Of The Year contender into the wall. Both drivers walked away, but it was a bitter pill for the Mexican Joe Gibbs Racing driver to swallow, who – unlike Kahne – needs a win to force his way into the play offs. From the resulting restart, Truex, Jr. and Jones raced away and the win looked certain to be between the two teammates. Following green flag pit-stops, the running order shuffled a little, with Kyle Busch having pitted later than the rest of the field earlier in the race and was able to stay out hoping for a caution. 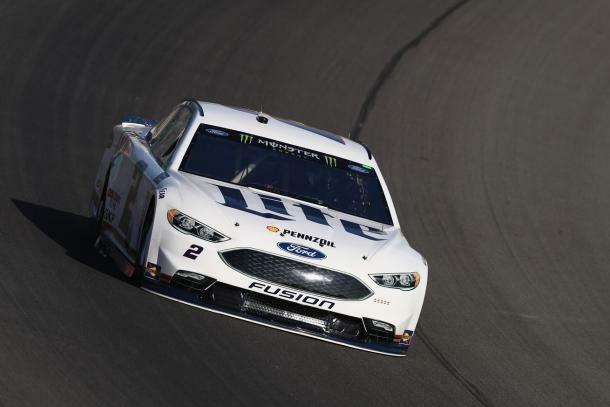 Busch’s prayers appeared to have been answered, with a caution being thrown with 13 to go when debris from a cut tire on Joey Logano’s #22 Ford found its way onto the race track. Any serious hopes that Busch had of winning were dashed when the leaders opted to stay out, with the #18 hoping that they would have all come in for fresh rubber. Eventual winner Larson did pit along with Busch, however, which actually saw him restarting in the eighth spot, directly behind Busch’s Joe Gibbs Racing Toyota who was in sixth. The front row was again an all Furniture Row affair, and a win for anyone but either of those two looked extremely unlikely. With the two Toyotas speeding into the distance, Larson found some speed that had been lacking and started making up some spots. Fate intervened on the Toyota parade with a twist in the tale. Michael McDowell and Paul Menard tagged each other with three laps remaining to bring out the fifth and final caution of the day. Truex and Jones were still one and two, with Larson having made his way to fourth. Truex chose the outside for the restart, meaning Larson was right behind him. When the green flag waved, Larson got a great start pushing Truex and then darting out between him and his Toyota teammate. The move had been endorsed over the team radio by owner Chip Ganassi prior to the restart, and it turned out to be the right one. It was an exciting finish to a race that, in truth, seemed to otherwise lack many incidents. The drivers move on to one of the highlights of the season next weekend – the Bass Pro Shops NRA Night Race at Bristol – and there is sure to be some sparks flying and tempers flaring on the Tennessee short track.